This write-up is by teen Sirisha Gudavalli. In order to learn more about what science actually is and what doing science in the real world looks like, it is important to talk to real scientists and learn about both their research and their journeys to getting to where they are today. 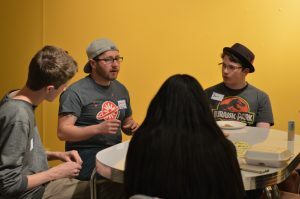 At our most recent Teen Science Café, we had six scientists from different STEM fields: Physics, Chemistry, Medicine, Engineering, Sustainable Design and Biology. The scientists consisted of graduate students, post-doctoral researchers, and early-career professionals and participated in a Science Speed Dating event where small groups of Café attendees spent about 10 minutes with each scientists learning more about their research, their day-to-day life, and how they ended up in their respective subject areas. First, we had Morgan Shimabuku talk to us about water conservation and its importance to the agricultural sector of our economy and our day-to-day life, especially in places like California. We also had Kyle Shimabuku talk to us about water contamination/purification engineering and how water can easily be filtered by passing it through activated charcoal because charcoal’s large surface area picks up lots of particles. In addition, we had Ryan Langendorf talk to us about species interaction networks and the various roles an ecological system’s structure plays in its functioning. Next, we had Jay Kroll talk to us about the atmospheric chemistry of Venus and sunlight driven reactions of sulfur dioxide with water and other atmospheric species. Afterwards, we had Megan Peterson who talked to us about evolutionary biology and the genetics of plants. Most interestingly, she showed us a flower that looks plain yellow to the human eye, but when viewed in the infrared, there is a dark circle in the center that serves to attract bees to the pollen so that they can effectively pollinate. Lastly, we had Catherine Klauss talk to us about atomic physics and supercooling atoms. Specifically, we learned about her research with Bose-Einstein condensate, including its properties, how it is prepared, and what they test. Most interestingly, she talked about how they utilized the principle behind the Doppler effect to cool the matter to close to zero Kelvin using a laser. 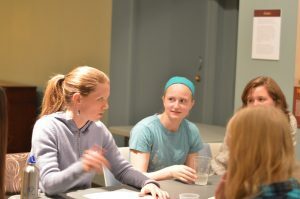 Overall, the café was an eye opening experience that gave each participant a taste of many fields of science. 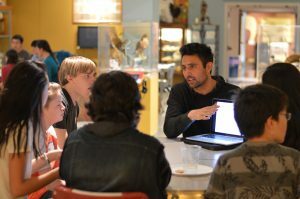 Equally important, café attendees learned about the scientific process and the different paths each scientist took to discovering their respective passions. In this Café, we had a couple of hands-on activities that mainly served as icebreakers. Before the speed dating, we had the participants separate into 6 teams, each with one scientist. 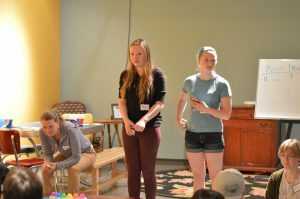 We then had a variety of challenges, including science bowl-type questions with buzzers, a play doh pictionary game, and a competition to name as many fields of science as possible. Every group names a representative they go up and then we go around and the reps from each team have to answer the question without pausing for more than a few seconds and can’t repeat what someone else has said or else they’re out. Playdough: make an X out of playdough (like Pictionary, but with sculpting). Representatives are given the clue at the same time, they return to their group and we tell them when to start modeling.